This image is labelled Dr. Jonathan Foote, born on Oct. 31, 1804 in Cornwall, Vermont. According to the History of the Town of Cornwall, he graduated from the Vermont Medical College at Castleton in 1829 and settled in Whitby, Canada West, the following year. In Feb. 1835, he married Robina Dow, daughter of William Dow (1777-1855) and Margaret Lumsden (1785-1833), also of Whitby. The Ontario Observer recounts that he lived on Kingston Road but settled in Prince Albert, Reach, where the "arrival of a doctor was a great gain to the township." He is buried in Union Cemetery, Oshawa. This image bears a strong likeness to his brother, the Hon. 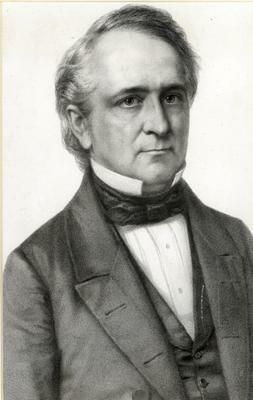 Solomon Foot, a senator from Vermont during the US Civil War. He was chairman of the committee of arrangements for the inauguration of President Lincoln. One of his last speeches was in favour of terminating the reciprocity treaty with Canada. This image came down to me through Helen Robina (Foote) McGrandle, my great grandmother, who was raised by Dr. Foote and Robina (Dow) Foote, who were her grandparents. She attended Loretta Abbey in Lindsay and wrote poetry for the Victoria Warder. She described her grandfather as "he whom we love so well."